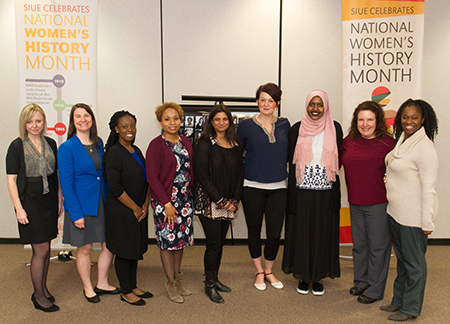 While they may not be prominently known, seen or heard, these exceptional women are making Southern Illinois University Edwardsville and the region better in the area of diversity and inclusion. Seventeen women were honored on Wednesday, March 21 at SIUE’s Fourth Annual Phenomenal Women’s Luncheon in the Morris University Center. Seventy-three women from SIUE and the Metro East community were nominated this year and 17 of those were selected to attend the luncheon. All nominees will receive certificates signed by SIUE Chancellor Randy Pembrook and Brown. Pembrook congratulated the women at the luncheon for doing their part to fulfill part of the University’s mission. Nine of the 17 SIUE Phenomenal Women selected for 2018 attended the Fourth Annual Phenomenal Women’s Luncheon on Wednesday, March 21. 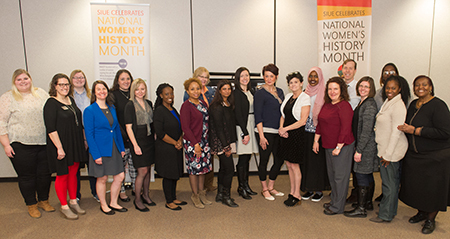 Shown from left to right: Jennifer Cline, Elizabeth Stygar, Tarsha Moore, Lakesha Butler, Suman Mishra, Michelle Hudson, Husna Ibrahim, Alison Reeves and Kim Carter. 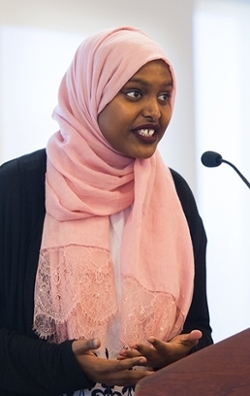 Husna Ibrahim, general assistant in Disability Support Services, gives her definition of a phenomenal woman. Shown are Venessa Ann Brown, PhD, associate chancellor and chief diversity officer (far right) and seven of the 17 Phenomenal Luncheon Women honorees and those who nominated them.